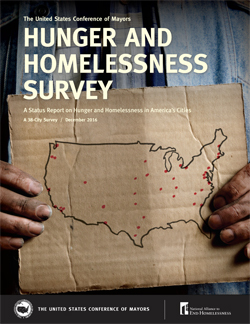 Washington, D.C. – January 6, 2017—In its “Status Report on Hunger and Homelessness” released in December, the United States Conference of Mayors confirmed what we in the trenches are already experiencing: Washington, DC, has the highest percentage of homeless people in the US——not a sought-after distinction for our capital city. As the national capital, Washington has long attracted those in search of a better life. DC’s “serve all comers” policy also attracts those in need from less caring and less prosperous regions of the country. DC is a “light on the hill” that can’t be hidden. In fact, Central Union Mission’s work began in 1884 serving homeless men, many of them Civil War veterans, often inebriated, who came to the Capital for help. Recent media focus has been on the lack of affordable housing, which is indeed a serious problem, but the Mayors’ report actually cites low wages as the biggest cause of urban hunger. That’s why job training and employment are central to the Mission’s efforts. Like many of our fellow nonprofits, we discovered that the final step in restoring a man or woman to full, successful participation in society is a decent job. At Central Union Mission we have a record of over 100 years of rehabilitation through faith. The model still works. However, we have learned that a wonderfully cleaned up man who is unemployed is still most likely homeless. Our growing work programs need to be just as productive as our spiritual programs. At the Mission we challenge those who are able to enter our variety of work-related recovery programs. After their initial 30 days, we limit the time guests can enjoy our state-of-the-art shelter. But for those who are eager to work, the Mission guarantees a job or specialized training upon completion of our premier program. If in working together the Mission can’t find a graduate a job, it will hire him or her. Our Ready2Succeed programs offer homeless people training, experience and pay for a variety of skill-sets: baking, recycling, street maintenance and cooking. Not only do participants learn specific tasks, but they also learn soft skills like anger management, taking responsibility and timeliness, which generalize to any type of employment. In our nation’s capital we should all promote training, hiring, and encouraging our people to work. We continue to need focused efforts from our government, nonprofits, places of worship and businesses to all pull together to lower this number drastically. To succeed we must open our jobs to those who have been in prison or have recovered from addiction. We must continue to train our workforce if we are to reduce our numbers and compete — even with our own suburbs — for jobs. It can be done, but our efforts must increase.